John Hart returns to the geographical and familial terrain that made "Down River" an Edgar winner and one of my favorite mystery recommendations. Orphaned brothers Michael and Julian survived the brutality of Iron House, a North Carolina orphanage. Now, as adults, they must face the past before they can claim their future. Two families. Two brothers. One explosive secret. 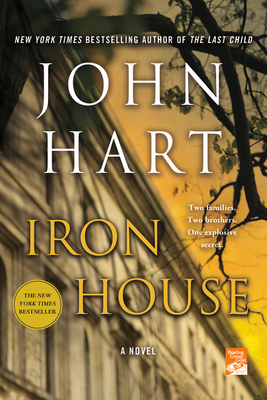 John Hart has written four New York Times bestsellers and won an unprecedented two back-to-back Edgar Awards. The New York Times labeled his work "Grisham-style intrigue and Turow-style brooding." Now he delivers a gut-wrenching, heart-stopping thriller no reader will soon forget. There was nothing but time at the Iron Mountain Home for Boys, time for two orphans to learn that life is neither painless nor won without a fight. Julian survives only because his older brother, Michael, is both feared and fiercely protective. When an older boy is brutally killed, Michael makes the ultimate sacrifice to protect his brother: He flees the orphanage and takes the blame with him. For two decades, Michael thrives on the streets of New York, eventually clawing his way to a world of wealth, fear and respect. But the life he's fought to build unravels when he meets a woman who knows nothing of his past or sins. He wants a fresh start with Elena, the chance to build a family of his own. But a life in organized crime is not so easily abandoned. With a price on his head and everyone he loves at risk, Michael spirits Elena back to North Carolina, to the brother he'd lost and a thicket of intrigue more dense than he could possibly imagine. In a tour de force narrative of violence, hope and redemption, the brothers must return to the Iron House of their childhood, to the place that almost broke them, the place it all began. JOHN HART is the author of the New York Times bestsellers, The King of Lies, Down River, The Last Child, Iron House, and Redemption Road. The only author in history to win the Edgar Award for Best Novel consecutively, John has also won the Barry Award, the Southern Independent Bookseller’s Award for Fiction, the Ian Fleming Steel Dagger Award, and the North Carolina Award for Literature. His novels have been translated into thirty languages and can be found in more than seventy countries.